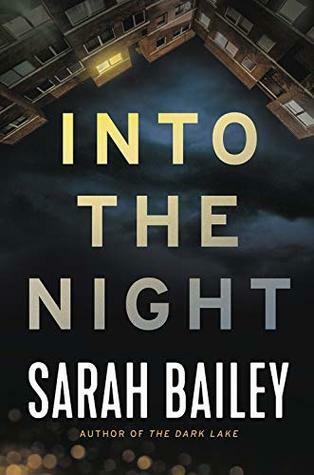 INTO THE NIGHT BY SARAH BAILEY – Books, Books and More Books! Sarah Bailey follows up her thrilling novel Dark Lake with Into The Night. I think all of us who read The Dark Lake were hoping there would be another and soon! DS Gemma Woodstock has had more than her fair share of knocks and has left her young son to move to Melbourne. A big city with big city problems. Personally and professionally she is feeling out-of-place and very much alone. Her new partner, Nick Fleet doesn’t seem very friendly and talks less than Gemma. When they pick up a case of a homeless man, stabbed to death in an alley, the full impact of her own lonely and almost invisible life hits her. Even after being pulled off the case when a high-profile case is suddenly thrust upon them, she can’t stop thinking about the homeless man. Why would someone want to stab actor Sterling Wade? During a filmed scene? With so many people involved, the suspect pool is growing bigger each hour. Every one of them have secrets they would rather not share but are they worth killing over? It would seem so. Gemma is such a flawed character. At times I want to shake her and other times make her a nice cuppa and find her a boyfriend. I actually like the fact that she is a hot mess. Haven’t we all been at one time or another? So Gemma, I’ll stick with you and see what you get up to next! This sounds like a good one, if I had any extra time. Wonderful review.